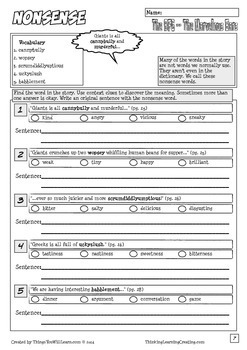 The BFG Workbook has "comic style" worksheets and novel study activities for the story by Roald Dahl. 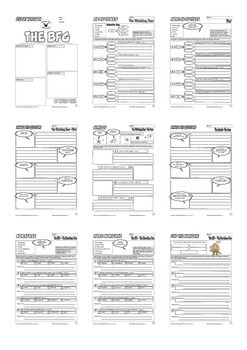 It includes; cover page with a background knowledge activity, vocabulary (14 pages), questions (6 pages), similes (1 page), creative activities (5 pages), puzzles (2 pages), and word problems (1 page). It also includes the answers to the two puzzle pages. No other answer keys are provided. 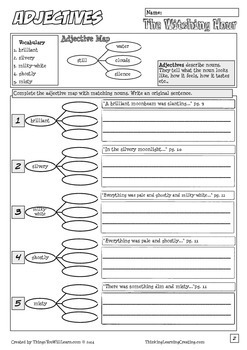 The vocabulary pages include nouns, verbs, adverbs, adjective, synonyms and antonyms. Each question page has five questions. Clipart is intentionally absent from this workbook. It is designed so students can add their own artwork. 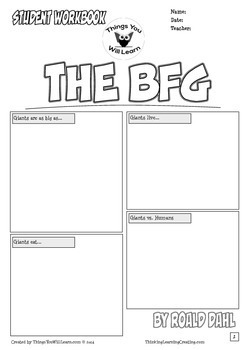 The BFG Comic Style Workbook by Michael Allen Kelly is licensed under a Creative Commons Attribution-NonCommercial-NoDerivatives 4.0 International License.